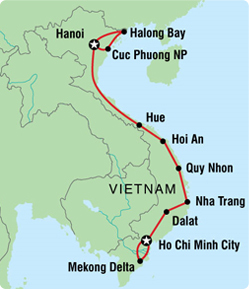 Day 8: Hanoi – Departure (Meal: B). A warm greeting waits at Hanoi’s Noi Bai airport, your private guide and driver will meet you in the arrivals lounge and drive you directly to your hotel in downtown Hanoi (travel time approximately 45 minutes). After checking in (room is available from 12:00pm), if you are interested, your guide will take you on a cyclo / rickshaw tour of the French Quarter where the grand boulevards offer a welcome escape from the busy Old Quarter. You will also pass by the Municipal Theatre (also known as the Opera House), which is based on Paris’ Opéra. 7:00 – 7:30: Pick up from your hotel and depart from Hanoi to Mu Cang Chai (distance: 285 km) follow no.32 road. On the way, we have two break point and you can enjoy some beautiful sightseeing, take photos, stop at tea planation for a cup of tea. 12:00: Arrived in Nghia Lo town, Yen Bai province. Enjoy a lunch in a local restaurant, then keep on driving up to Mu Cang Chai. We stop-over in Khau Pha Pass for taking beautiful photos of Lim Mong valley. We continue driving for about 40km to Ngoc Chien, located at an average altitude of 1,800 m above sea level compared to the year-round mild weather is like Dalat. This beautiful and peaceful commune is the home of the Thai, Hmong, and La Ha ethnic groups who have many unique customs and habits, one of them is naked bathing custom. In addition to the special identity of the local, the other great factors that make Ngoc Chien attract more tourists annually are the natural hot mineral springs and the century-old stilted houses made of Pomu. You will be welcome by local family, enjoy a warm meal with many local specialties such as Tao Meo wine, Tan sticky rice, grilled chicken, grilled fish. Overnight with local family at Ngoc Chien. After breakfast, we drive to Mu Cang Chai, the land of the most beautiful rice terraces. When you get in Mu Cang Chai, be ready to be impressed by the marvelous scenery of the terraced fields, unique culture and traditional lifestyles of people living there. Here are 500 ha of terraced fields in 3 communes as La pan Tan, Che Cu Nha and De Xu within the whole 2,000 ha terraced fields of the area. For years, Mu Cang Chai has become an ideal stop for all nature lovers and adventurous travellers. Overnight at Mu Cang Chai Eco Lodge. Shooting in Mu Cang Chai area, enjoy the great scenery of terrace rice field at Mu Cang Chai and drive to Sapa. Arrival Sapa, drive uphill offers most spectacular scenery of Fansipan Mount. Just a kilometer out of the town, rose flower farms and later chayote grows on bamboo frames covered a vast area. We’ll stop at the magnificent Silver Waterfall before continue the road trip for some kilometers further to Heaven Gate and Tram Ton Pass. At 2047m above sea level, the Heaven Gate & Tram Ton Pass is the highest mountain pass in Vietnam. From here enjoy walking around for half an hour for beautiful scenery of both two side of Hoang Lien Son mountain range. The wind blows stronger to force the clouds moving constantly. It is the best point here to enjoy breathtaking scenery of the two side of Fansipan Mountain Range. Amazingly that the weather is very different by the side: In many days It is foggy and cloudy on Sa Pa side and sunny brightly the other side. Continue on, you will take a cable car to Fanxipan Mountain. Currently the highest point of Fanxipan is at 3,143m high. As you know the cable in Sapa is the world’s longest and highest cable car, running up from sleepy Sapa town to the Peak of Fanxipan Mountain, known as Indochina’s rooftop. Enjoy the view from the highest point of this incredible mountain. The lush green and subtropical vegetation makes this mountain really very beautiful. Take some pictures for unforgettable experience from the top. After taking scenery then get cable car back to Sapa. We check out hotel then drive to overland to a market of the hill tribal people. Depending on the day of the week, Bac Ha, home to the flower H'mong hill tribe minority people is open on Sunday, Can Cau on Saturday, Coc Ly on Tuesday, Cao Son market on Wednesday, and Lung Khau Nhin market on Thursday. In all these markets, we can meet hundreds of beautiful women from Flower Hmong tribe, who are famous for their wonderful craft and hand-made flowering clothes and textile fabrics, or intermingle with people from Black Hmong, Dzay, Dzao and other ethnic groups coming to the market not for purchasing stuffs, but for meeting and chatting – just once a week - like in a real cultural centre. After lunchtime, we drive to Hanoi. Upon arrival at Halong Bay we embark on a boat trip to cruise discovering this magnificent UNESCO World Wonder. This is a great journey among surreal islands rising from a tranquil emerald sea. You will visit several key locations. – Stop at a beautiful beach and take a refreshing swim or sunbathe on the sundeck; take a short trek to the nearby summit for a panoramic view of the bay. Back onboard the junk, you will watch the sunset and be served a sumptuous dinner, with cocktails available for purchase from the bar. You will spend the night onboard the junk, in a cabin with an ensuite bathroom. Notes: The program may differ slightly based on the junk cruise’s itinerary. Early morning coffee and tea will be served on the sundeck followed by a Tai Chi class. After breakfast we take a Sampan boat or Kayak to explore the bay. We may have a chance to see the wild monkeys that gather around waiting for food from the tourists. After that we continue to cruise around the bay. Lunch is served on the boat on our way back to the docks then we transfer back to Hanoi. Free time until we are transferred to the airport for our onward flight.